This game is no longer sold anywhere. This exclusive for collectors of remote or rare games. Fable III - the continuation of a bright and dynamic game, which received the highest marks from critics and the approval of the users themselves - sales of Fable II exceeded 6 million copies. The events in Fable III unfold 50 years after the adventures described in Fable II. Albion is ready for the industrial revolution, but the kingdom is in danger. In Fable III, before you take the throne, you will have to go through a lot - to participate in bloody battles side by side with your subjects, to know the love and pain of loss. All the decisions you will make, first fanning the flames of the revolution, and then - sitting on the throne of Albion, will have a tremendous impact on the fate of the whole country and all its inhabitants. During the game you will meet various original characters, performed with the characteristic Fable humor and in a characteristic style. Determining whether they are your friends or, on the contrary, enemies, you either join them or engage in a fierce fight with them. This can be done alone or with friends, you will act either for the benefit of the entire state, or to achieve your own selfish goals. Who will you become - a hero or a villain, a desperate rebel, a new tyrant or the greatest of kings? You decide! - Become a hero and "create" your own destiny. The story begins with the fact that you and your hero find yourself in the epicenter of the events of Fable III. On the way from the revolutionary to the ruler, you will have to go through a lot - you are awaited by exciting actions, bright and dramatic. Interaction with the world of Albion has never been so easy and enjoyable. In the system of expressions (Expressions), a new original Dynamic Touch function has appeared, which will allow your hero to reach out or hug a loved one or take revenge on those who betrayed you. Your hero, your dog, and even your weapons undergo changes, reflecting your "moral character" and fighting style. The emotional connections that players make in the Fable III world will bring you an unforgettable experience. - When a popular action game becomes an adventure. Your journey is transferred from the streets of a thriving industrial Albion to the battlefields. The innovative one-button combat system allows players to easily combine different styles - in their arsenal melee weapons, ranged weapons and magic. The basic principle of the Fable world is that the player is given the opportunity of a wide choice, and everything around depends on this choice. Good or evil, love or hate, career or family, or only you and your faithful companion dog live the life you have always dreamed of! In this game, even more than before, your choice leads to significant consequences that affect your whole being. Whether a decision is made in an insignificant quarrel or a change in the chosen direction for the whole kingdom - these key decisions will forever change the world around. - Additional quest: A new dungeon and a new quest, for which you will receive the legendary sword Wolfbane (Curse of the Wolves), greatly increasing your chances in a fight with wolves and balverines (Balverine). - Exclusive location: The perfect place to move there with your family or go in search of treasure. - A new breed of dog: Boxer (Boxer), known for his devotion, will be a great companion for the king or queen. - Unique outfit: One male and one female outfit from distant Aurora, the new state in Fable III. 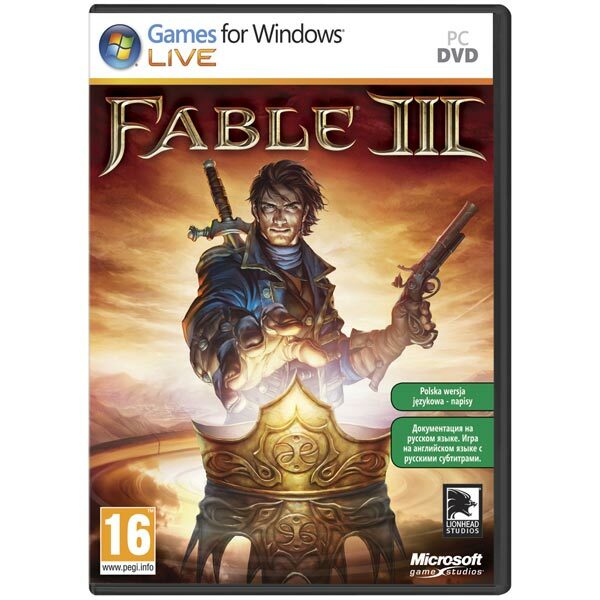 After the purchase, you receive the activation key of the Fable 3 game in the Games for Windows Live (GfWL) service, as well as a link for downloading the disc needed to install the game on your computer. Before buying, please check the system requirements of the game and other parameters. Products purchased by mistake, as well as unsuitable to you according to system requirements or region of activation, can not be returned and exchanged!